Myelodysplastic syndrome (MDS) and acute myeloid leukemia (AML) are malignant hematopoietic stem cell disorders, and abnormal stem cell populations in hematopoietic stem and progenitor cells can cause disease. Traditional treatments to date can not completely eliminate these abnormal hematopoietic stem cells associated with the disease. Recently, researchers from the Albert Einstein College of Medicine have discovered a prognosis molecule that predicts both MDS and AML. Furthermore, an antisense oligonucleotide targeting the disease-causing molecule was identified to have a potential therapeutic effect on both MDS and AML diseases. In this study, the researchers performed the transcriptome analysis of hematopoietic stem cell and progenitor cell in patients with MDS and AML and found that STAT3 was overexpressed. They also found that overexpression of STAT3 in a larger MDS population may predict shorter survival times and more severe clinical outcomes. 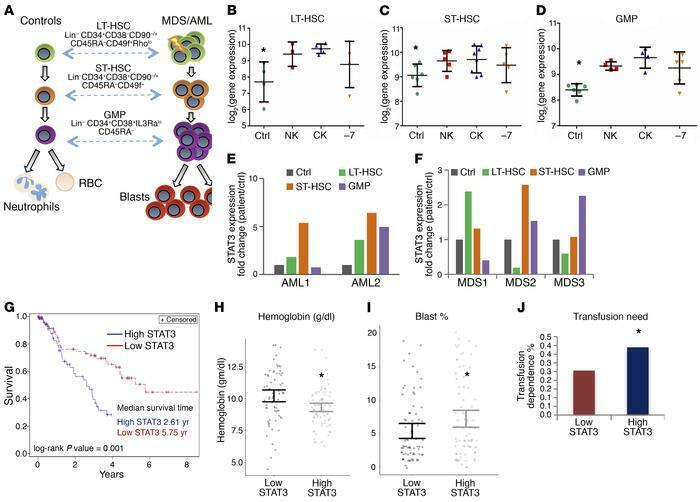 The results suggest that the high expression of STAT3 in MDS CD34+ cells results in similar cell characteristics to other known leukemia-promoting genes. Functionally, inhibition of STAT3 expression by the antisense oligonucleotide AZD9150 can result in decreased activity of leukemia cells and increased apoptosis. AZD9150 is rapidly swallowed by MDS/AML stem cell and progenitor cells, resulting in enhanced differentiation of cells. Knockdown of STAT3 expression also impairs the growth of leukemia cells in vivo, resulting in decreased expression of MCL1 and other oncogenes in malignant cells. Overall, these results suggest that STAT3 is a detrimental prognostic factor in MDS/AML disease, and this study provides a reasonable preclinical mechanism for the use of AZD9150 in these diseases. Aditi Shastri, et al. Antisense STAT3 inhibitor decreases viability of myelodysplastic and leukemic stem cells. J Clin Invest. 2018 Dec 3;128(12):5479-5488. doi: 10.1172/JCI120156.